The Wooden Iron Tables, offered by us, are a perfect articulation of strength and design. 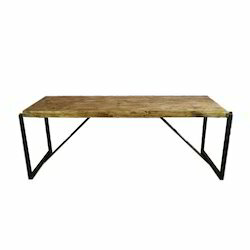 The lower portions of the Wooden Iron Tables are constructed with iron to give rigid support to them. The Wooden Iron Tables, we offer, are highly demanded owing to their attractive designs and elegant looks.